1 of 1 Bring large pot of water to boiling for cappellini. 1 of 1 In food processor, coarsely chop walnuts. Add parsley, Parmesan, oil, garlic, lemon juice, salt and pepper. Pulse until well combined and walnuts are finely chopped. 1 of 3 Add cappellini to boiling water. Cook 4 to 6 minutes following package directions. 2 of 3 In large skillet, melt butter over medium-high heat. Add scallops and herbs de Provene; saute 3 minutes. Add wine; cook 1 minute. Remove from heat. Drain cappellini. 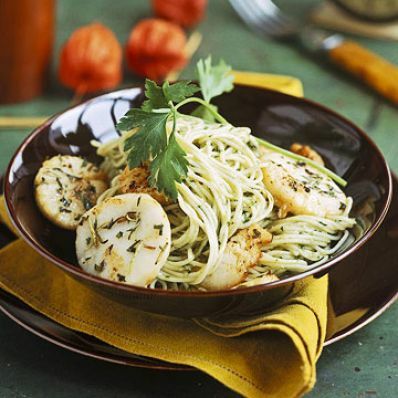 3 of 3 In large bowl, toss scallops with any pan liquid with cappellini and walnut pesto. Serve immediately. Makes 6 servings.